1.Ensure the surface is flat and smooth.Use a dry cloth to clean the surface and the suction cup. 2.Place the suction cup against the flat surface. 3. Press the center of the suction cup firmly and ensure any air between the suction cup and the surface is removed. 4.Rotate the outer body of the suction cup in a clockwise direction by approximately 60° until it locks in place with a 'click'. 5.To remove, simply follow the above steps in reverse. 1. Material and Size:Ergonomic ABS plastic handle, Chrome plated hook, surface UV light treatment, fashionable and beautiful 19.6x6.5x4.5cm (LxWxH). 2.Super Suction Force: 15kg weight bearing capacity, Vacuum suction technology makes the suction firm, not easy to fall off, safe and secure. 3. Easy to install and remove: no need drilling, no tools, no glue needed, easy to install in 5 seconds and reusable. Mounts on any smooth flat surface including tiles, glass, metals, plastic and so on. 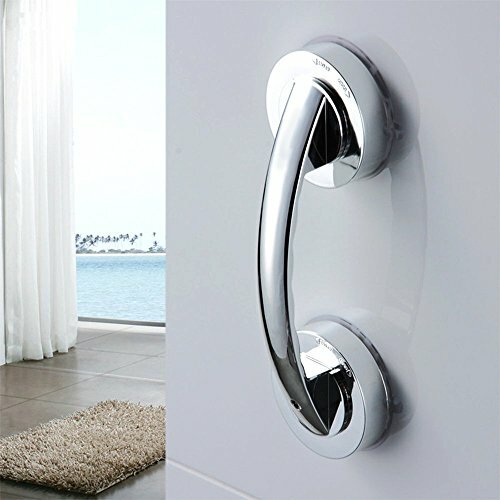 4.Perfect door handle for home, hotel, office. Can be used as grab bar for wall, kitchen, bathtub, shower to assist preventing dangerous slips and falls, specially for child and elderly. 5.Please note 15kg weight bearing capacity is not able to pull one human up, it is a balance aid only and mainly used asdoor handle. If you have any questions about this product by Homa, contact us by completing and submitting the form below. If you are looking for a specif part number, please include it with your message.